Finally, a set that is not only functional and affordable, but attractive. This table features a rich cherry finish. The matching stool has supple brown leather, a rectangular back stool, and transitional design elements. This set perfectly complements our game set or stands alone as handsome addition to any bar area or kitchen. The Ambassador Bar Height Table with Fluted Pedestal Pillar by Hillsdale at A1 Furniture & Mattress in the Madison, WI area. Product availability may vary. Contact us for the most current availability on this product. 6124-841 Bar Height Table - Base 1 0" 0" 42"
6124-840 Bar Height Table - Top 1 36" 36" 0"
This collection of dining and game table sets is the perfect addition for entertaining in your home. The casual sets include a bar height table and chair and a game set. 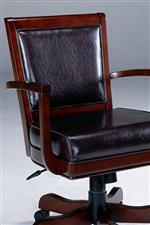 The chairs are comfortably upholstered in a brown leather and the table features fluted pedestal bases. 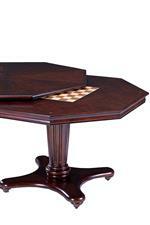 The game table in this collection has a removable dining top, revealing a built in checkers/chess board. The Ambassador collection is a great option if you are looking for Transitional furniture in the Madison, WI area. Browse other items in the Ambassador collection from A1 Furniture & Mattress in the Madison, WI area.